Fourteen fantastic client-dog teams graduated from Freedom Service Dogs during an emotion-filled ceremony on Dec. 6 at Parker Arts, Culture & Events Center. The honorees included seven veterans, three children with autism and special needs, two clients with mobility challenges, and two therapists matched with professional therapy dogs. Four of the veterans graduated from FSD’s Operation Full Circle program, in which veterans with PTSD and traumatic brain injury work alongside our trainers for four months to train the dogs provided to them by FSD. Two of our young grads and their families took part in our Disco’s Dogs program, which provides service dogs to families of children with autism or other developmental disabilities. The remaining dogs and their new human partners each attended a two-week placement class at FSD’s training center, where they built on months of training the dogs had previously received from our professional trainers. During that time, each dog was custom trained to assist their new person with specific tasks, while each person learned basic dog care and behavior, practiced commands, and bonded with their dogs. We hope you’ll enjoy reading about all our remarkable graduates, and be sure to mark your calendar for our next graduation on June 15, 2019, which is free and open to the public. Shay served in the U.S. Navy for four years and has been diagnosed with PTSD. Through FSD’s Operation Full Circle program for veterans, she was placed with a calm, chill Labradoodle named Tiptoe, who accompanies Shay in public to relieve her anxiety and panic disorder. Says Shay, “Tiptoe came into my life at the right time, and I feel we have already became a team.” Tiptoe came to FSD from Sam Coffey Animal Rescue in Junction, Texas. This team is sponsored by Vets Helping Heroes. Eddie joined the U.S. Army in 1998 and at 25 years old, he became an elite U.S. Army Ranger who was deployed three times to Afghanistan and twice to Iraq for a total of 38 months. 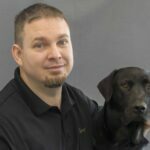 The retired veteran lives in Cheyenne, Wyoming, with his wife, a couple horses, and Scrappy, a Great Dane mix who was matched with Eddie in FSD’s Operation Full Circle program. Says Eddie, “Just thinking about my new partner, Scrappy, puts a smile on my face. He doesn’t know it, but he has saved my life already, and I believe he will save me many more times.” Scrappy came to FSD from Peaceful Animal Adoption Shelter (PAAS) in Vinita, Oklahoma. This team is sponsored by Vets Helping Heroes. Chris, a U.S. Marine Corps veteran who saw action in the first Gulf War, is the human half of Team Noodle. 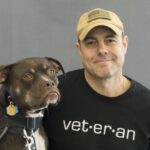 FSD’s Operation Full Circle program for veterans bonded these two into an inseparable team in which Chris provides love and care for Noodle, a boxer mix, and Noodle gives his Marine unconditional love and attends to his PTSD symptoms. Says Chris, “Noodle is an amazing companion, full of love and never short on personality. He is always there to help me get through life with a smile.” Noodle came to FSD from Foothills Animal Shelter in Golden, Colorado. This team is sponsored by Vets Helping Heroes. Tom is a U.S. Army veteran who served two tours in Iraq. He was matched with Norwin, a black Labrador retriever, through FSD’s Operation Full Circle program. Norwin assists Tom in public so that he can go more places with his children, and he also helps Tom sleep better by nudging him awake from the recurring nightmares that have resulted in more than a decade of sleep loss. Norwin came to FSD from the Prison Trained K-9 Companion Program. This team is sponsored by Vets Helping Heroes. 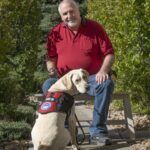 Jeff is a U.S. Air Force veteran who was matched with service dog Cello, a loving Labrador retriever who is helping Jeff address his PTSD symptoms and give him more confidence in social situations. Cello has been trained to create space around Jeff in public, wake him from nightmares when he tosses and turns, check out the house before Jeff enters, pick up items, push handicap buttons, and more. Cello came to FSD as an owner surrender. This team is sponsored by AnnieMac Home Mortgage. U.S. Army veteran Kari served three years in Afghanistan and has been diagnosed with PTSD, which causes her to be hypervigilant and anxious in public places. She is graduating with Matcha, a German shepherd mix who Kari says is assisting her with “everyday living and functioning in society. She is my battle buddy, since I no longer have one.” Matcha is helping Kari feel calmer in public places and safer in her own home as she works to gain back her independence. Matcha came to FSD from the Dumb Friends League Buddy Center. This team is sponsored by the Dixie Foundation. Aiden is a kind and loving 9-year-old boy with special needs who adores animals and loves learning about science, especially dinosaurs and fossils. Aiden wanted a dog that would be his best friend, and he and his mother are excited about having a service dog to help Aiden with mood regulation, social-emotional skills, sensory processing, and independent living skills. His mother reports that Aiden and Aiko, a 1-year-old golden retriever, are doing amazing together, and she believes Aiko will be instrumental in helping Aiden progress in life and to pursue his dreams. Aiko came to FSD as a shelter diversion. This team is sponsored by John and Megan Zimmerman. Bright, creative, 11-year-old Austen has a passion for animals. When Austen and her family applied for a service dog to help with her autism, Austen took it upon herself to learn everything she could about dogs in general and service dogs in particular. Gentle goldendoodle Murdoch was matched with Austen to help her feel calmer in crowded environments, increase her comfort level in stressful situations, enhance her social interactions, and assist with managing her “big feelings.” Murdoch came to FSD as an owner surrender. This team is sponsored by John and Megan Zimmerman. Melissa is a recreational therapist who has been matched with professional therapy dog Munchkin, a friendly and lovable border collie mix. Munchkin accompanies Melissa to her job at the Veterans Community Living Center at Fitzsimons in Aurora, Colorado, which provides care for veterans, their spouses, and Gold Star parents. Munchkin greets visitors and sits with veterans, providing pet-therapy interaction that brings comfort to the residents and enriches their lives. Munchkin came to FSD from the Prison Trained K-9 Companion Program. This team is sponsored by Halliburton. 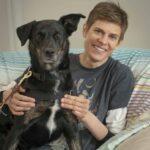 Naomi is graduating with her professional therapy dog, Jaya, a well-mannered, intuitive Australian cattle dog mix who joins Naomi in her work as a clinical social worker. Jaya helps break the ice and provides a sense of trust and safety during therapy sessions. Says Naomi, “Dogs can be a great help in the healing process. Jaya is an absolute dream, and I am thrilled to partner with him to help my clients have happy, healthy lives after trauma.” Jaya came to FSD from the Dumb Friends League Buddy Center. This team is sponsored by Halliburton. Ian is a kind, affectionate young man with autism, ADHD, and cerebral dysrhythmia, a seizure disorder. He loves bike races, movies, football, basketball—and now Race, the 1-year-old yellow Labrador retriever who is Ian’s second service dog from FSD. 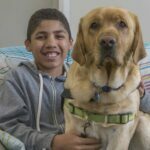 In addition to offering comfort and companionship, Race helps Ian deal with situations that overwhelm him by providing sensory pressure, interrupting repetitive behaviors, and creating space around him in public. Race came to FSD from Amigas Labradors. This team is sponsored by Gilda Kaplan. Amanda, a licensed professional counselor, suffered a spinal-cord injury 25 years ago that left her with limited mobility and range of motion in all four limbs. Australian cattle dog mix Ava has been trained to help Amanda retrieve items, open and close doors, tug off her jacket, push handicap buttons, and more—all with the goal of helping Amanda do her job and live her life as independently as possible. Ava came to FSD from Midland Humane Coalition. This team is sponsored by Halliburton. In 2001, Diane suffered hand and back trauma from an injury, resulting in reconstructive surgeries that left her with a limited range of motion in her hands and back. Golden retriever Squints helps Diane pick up and carry objects, open doors, and tug off her coat, among other tasks. A Canadian Native/Alaska Native acupuncturist and herbalist who lives in Arizona, Diane is looking forward to bringing Squints on her annual trips to Alaska, where she performs traditional songs at gatherings. Squints came to FSD as a shelter diversion. This team is sponsored by the Eugene C and Florence Armstrong Family Foundation.